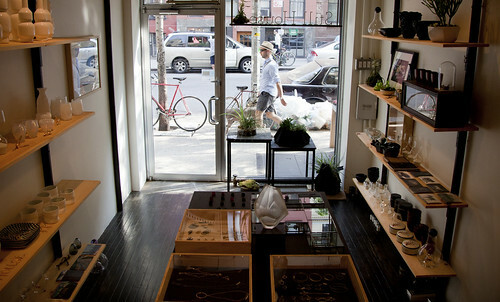 Joshua Davis East Village boutiques have thrived by offering low priced merchandise to its customers. Still House, 117 East Seventh Street, sells artwork and jewelry by local artists. With reports of hard times for struggling Lower East Side boutiques, The Local paid a visit to merchants on East Seventh Street to see how their businesses are faring. But rather than echoing the frustrated voices of Lower East Side merchants, many of whom have closed or moved to Brooklyn, the East Village is holding steady and even opening new stores. Here is what some local shopkeepers had to say about starting up and surviving in the East Village. Two newcomers to the block, both stores opened within a week of another last month, and both specialize in selling goods from local artists and designers. Rena Reborn, which sells new and recycled jewelry and clothing for women, draws many of its customers with $5 and $10 racks. “Low prices keep us in business,” says owner Rachael Rush.